Lutitia Achea Claiborne (sometimes spelled “Luticia”) was born on 15 August 1824 as the seventh child of Ephraim and Polly Claybourn. [Unless otherwise noted, all of the biographical data here for Lutitia and her descendants were provided by Lutitia’s descendants Evelyn Spradlin (a descendant of David Richardson Williams) and Lynda Cook, in personal correspondence with Joshua A. Claybourn.] She married Jesse Williams (sometimes just called “Jess”), who was born on 27 March 1813 in Tennessee to David Williams and Elizabeth van Hooser. [Jesse’s father, David Williams, was born on 19 November 1784 (according to the family Bible) and died before 1850. His parents were David Williams (born on 19 September 1759) and Sarah “Sally” Unk (born on 13 January 1759). Jesse’s mother, Elizabeth van Hooser, was born in 1790 and died after 1850. Elizabeth’s father was Isaac van Hooser (c. 1764 – 5 April 1831) and her mother was Margaret Huffman (Hoofman) (c. 1763 – c.1796). These parents were of German origin and have a long pedigree that can be traced as far back as 1503.] Together Lutitia and Jesse would have nine children together, all listed below. Lutitia and Jesse remained in Van Buren / Cleburne County for the rest of their lives and can be found there on the 1870 census and 1880 census. Jesse died on 22 March 1890 in Quitman, Arkansas, and Lutitia followed in death on 22 August 1891. Four of Jesse and Luticia’s sons. Front row, left to right: John M. Williams and George W. Williams. 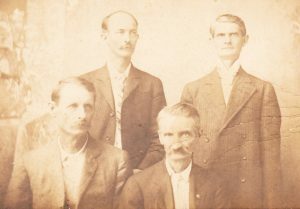 Second row, left to right: Williams C. Williams and Jesse M. Williams. 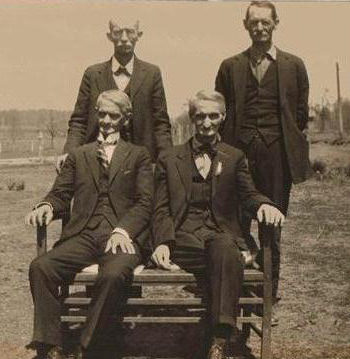 Two brothers were Methodist preachers, one was a blacksmith, and one was a farmer. These same four sons seated clockwise from the bottom right is John M. Williams, George W. Williams, William C. Williams, and Jesse M. Williams. John Monroe Williams (click name for separate biographical sketch) was born on 20 October 1843 in DeKalb County, Tennessee. His date of death is unknown. David Richardson Williams (click name for separate biographical sketch) was born on 8 July 1845 in DeKalb County, Tennessee, and died on 4 February 1900. Sarah Elizabeth Williams (click name for separate biographical sketch) was born on 17 November 1846 in DeKalb County, Tennessee, and died on 2 June 1890 in Quitman, Cleburne County, Arkansas. James Carroll Williams was born on 9 March 1849 in DeKalb County, Tennessee, and married on 7 July 1872 in Van Buren County, Arkansas, to Zilpha Patterson. [Zilpha was born in 1857 in Lauderdale County, Tennessee.] James died on 11 June 1889 and Zilpha followed some time after 1900, both in Quitman, Arkansas. Nancy E. Williams was born in September 1877 in Van Buren County, Arkansas. She married Richard Thomas Little in about 1896 in Arkansas. They had two children together. Vernon V. Little was born in about 1898. Herman L. Little was born in 1906. Vernon Williams was born in 1880. Nancy Jane Williams was born in 1852 in DeKalb County, Tennessee. She married (1st) in 1874 in Van Buren County to John Hudson. It is not known if this John died or they divorced, but on 31 January 1878 she married (2nd) Daniel Lewis Kennedy in Van Buren County, Arkansas. [Daniel was born on 24 May 1852 in North Carolina to Drew McGee Kennedy and his first wife Sarah “Sally” Waggoner. After his marriage to Nancy, Daniel Lewis Kennedy would marry a second time to Mary Elizabeth Sullivan and had nine more children.] Nancy’s date of death is unknown but it occurred after 1878. She had one child with John and one with Daniel Kennedy, each listed below. John Hudson, Jr. was born in about 1876 in Van Buren County, Arkansas. William Franklin Kennedy was born on 19 November 1878 in Van Buren County, Arkansas. On 23 May 1900 he married Ellen Mae Hudson in Van Buren County, Arkansas. They had five children together. William died on 9 April 1847 in Cleburne County, Arkansas, and is buried there in the Quitman Methodist Church Cemetery. James Lewis Kennedy was born on 23 March 1902 and died not many months later on 26 August 1902. Effie Kennedy was born on 16 July 1905 and died on 20 March 1989. Ralph Thomas Kennedy was born on 11 May 1908 in Van Buren County, Arkansas and died in February 1970 in Greenwood, Sebastian County, Arkansas. Fred Allison Kennedy was born on 10 August 1914 and died on 17 June 2002 in Cleburne County, Arkansas. William Truman Kennedy was born on 15 October 1923. Mary C. Williams was born in 1854 in St. Francois County, Missouri. In about 1879 she married John Ward (born in January 1854) in Van Buren County, Arkansas. Together they had two children. Mary died sometime before 1890 and John followed in 1916. Lutitia E. Ward was born in about 1879 in Van Buren County, Arkansas. On 24 January 1897 she married J. E. Thomas (born in 1874) in Cleburne County, Arkansas. James D. Ward was born in April 1881 in Van Buren County, Arkansas. William Claiborne Williams (click name for separate biographical sketch) was born on 9 October 1856 in Van Buren County, Arkansas, and died in November 1932 in Cleburne County, Arkansas. George Washington Williams (click name for separate biographical sketch) was born on 10 November 1859 in Van Buren County, Arkansas, and died in 1941 in Cleburne County, Arkansas. Jesse Milton Williams was born on 23 March 1864 in Van Buren County, Arkansas. On 17 July 1887 he married Zoie England in Cleburne County. [Zoie was born on 17 February 1867 in Arkansas to John McCamey England and LaVesta Ann Hamilton. Zoie’s parents were natives of Tennessee. They were married in Missouri and they were the parents of fifteen children, seven sons and eight daughters. In addition to Zoie, one of the children was Harriett, who married William Claiborne Williams. John McCamey England died in 1870. He was a member of the Methodist Episcopal Church and of the Masonic fraternity.] Jesse Milton Williams and Zoie England only had one child, a daughter, listed below. Jesse was educated at the common schools, commenced studying for the ministry in 1884, and was licensed to preach the same year. He went on to become the minister in charge of the Methodist Episcopal Church, South, at Ada. A brief biography published about him read, “Rev. Mr. Williams, though still a young man, has won many admirers by his brilliancy and promise. All speak highly of him as a courteous gentleman.”[Cathy Barnes, Biographical and Historic Memoirs of Western Arkansas, (Chicago: The Southern Publishing Company, 1891).] Jesse died in about 1890 and Zoie died in 1932, both in Arkansas. Nina Williams was born on 13 August 1888 in Quitman, Cleburne County, Arkansas. Nina married on 16 June 1915 in Atkins, Arkansas, to Ivan Roy Hill. [Ivan was born on 26 January 1878 in Hillsdale County, Michigan.] They had three children together. Nina died on 29 May 1986 in Cochise County, Arizona. Richard Williams Hill was born on 29 August 1916 in Carroll County, Arkansas. Richard died on 21 April 1983 in Dallas County, Texas. Mary Ellen Hill was born on 1 September 1926 in Carroll County, Arkansas.